It was a day when vintage beauties on wheels again had a tryst with the national capital. They all came to attend the 53rd edition of The Statesman Vintage & Classic Car Rally 2019 on Sunday. There were enthusiastic owners and drivers of the participating vehicles. There were also excited car aficionados and charmed onlookers and passers-by. All of them had a day-long vintage treat in the course of The Statesman car rally. The vintage automobiles started making a beeline outside Statesman House, Barakhamba Road, here since this morning. These mechanical marvels were brought to take part in The Statesman Vintage & Classic Car Rally by their proud owners. The rally again proved to be a perfect occasion for their prized possessions to display their glamour in full public view ~ and to tell enchanting stories about their glorious history. A legion of car enthusiasts and common people had also gathered there. All of them were sharing the joy being reflected by the occasion. They took pictures. They clicked selfies. They could not have asked for more on this beautiful, chilly winter morning. The rally was flagged off by Sanjaya Gupta, Managing Director of the PNB Housing Finance Ltd, at Statesman House. Chairman of The Statesman, R P Gupta, and Editor and Managing Director of The Statesman, Ravindra Kumar, were also present on the occasion. 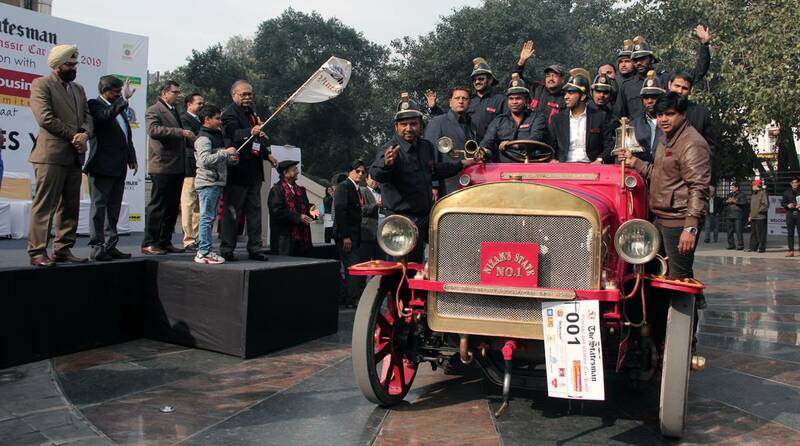 Being the oldest participating automobile in the rally, the 1914 John Morris fire engine, owned by the National Rail Museum, was the first vehicle to be flagged off. It was the cynosure of all eyes as usual. The cars moved gracefully in order of age, with the oldest cars being flagged off first to be followed by their younger counterparts. About 94 vehicles participated in the rally, which included 37 cars from the vintage category, 8 from the classic section, 18 from the post-War section, and 31 from other categories. Among a large number of remarkable cars which participated in the rally were Lanchester (1927), Chevrolet (1927), Austin (1928), Rolls Royce (1928), Ford (1929), Buick (1929), and Morris Minor (1929). The motoring marvels participating in the rally followed the route K G Marg-Curzon Road-India Gate-Pragati Maidan-Nizamuddin Ring Road-Noida Link RoadGreater Noida Expressway before turning back at Amity University, Greater Noida Expressway. The rally entered the Purana Qila road to end the journey at Major Dhyan Chand National Stadium near India Gate. After dazzling Delhi’ites through the entire route, these stunning vintage cars assembled at the National Stadium. Nitika Chopra came from Ghaziabad along with her eight-year-old daughter in the morning to watch the vintage show. “Last year also, I had come along with my daughter to see the event and we cherished the entire day by watching these beautiful old cars,” said Chopra, who later went from Statesman House to the National Stadium. The prize distribution ceremony was held in the afternoon at the National Stadium, where Delhi’s Lt Governor Anil Baijal presented trophies to the winners under various categories. About 53 trophies were awarded to the winners. Among the prestigious trophies given were The Statesman Challenge Trophy and the JMAI Trophy. Various parameters were taken into account while judging the prize-winners in various categories at The Statesman car rally on Sunday. A panel of judges ~ headed by veteran expert R N Seth, and comprising Jitender Pandit, Rakesh Jain, Gyan Sharma, Pramod Bhasin, Ashwin Kathpalia, Appa Saheb Allur, Bernard and Sanjoya Gupta ~ had also conducted the prejudging of the participating vehicles during 8-9 February at Modern School and given them points on various parameters such as restoration, authenticity and originality. The Statesman Vintage and Classic Car Rally is among the oldest running vintage car rallies in India. 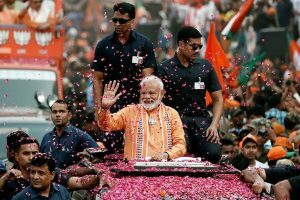 The rally was first held in 1964 in Delhi. Following its success, it was taken to Kolkata too in 1968. Last year, about 70 cars had participated in its 52nd edition in the national capital.